When will be Paul O'Grady: For the Love of Animals - India next episode air date? Is Paul O'Grady: For the Love of Animals - India renewed or cancelled? Where to countdown Paul O'Grady: For the Love of Animals - India air dates? Is Paul O'Grady: For the Love of Animals - India worth watching? In this new two-part series, Paul O'Grady heads to India for the first time in his life, to rescue and rehabilitate some of the country's vulnerable wild animals and experience the jobs of the keepers and conservationists who are looking after them.Filming at various locations across India, Paul meets extraordinary animals - old and young – who are in desperate need of care, both within sanctuaries and in their natural environments. In this first episode, Paul arrives in India and dives straight into a rickshaw to experience the crazy traffic, the sights and sounds of city life in Northern India. He's there to help animals, and his first stop is an elephant sanctuary south of Delhi, where he meets Lakshmi – an obese elephant. She's too heavy to walk to the river, so Paul's job is to give her a shower, soaking everyone in the process. In the second episode, Paul introduces us to Assam – a state known for its tea plantations - but also really important for wildlife, and home to Kaziranga National Park. Paul's working at CWRC, an animal rescue centre, and today he's helping look after no less than eight elephant calves. One-year-old Ultee has an injured foot, so Paul helps distract her while it's treated, and six-month-old Burhi needs to be rubbed in coconut oil, to help prepare her skin for winter. 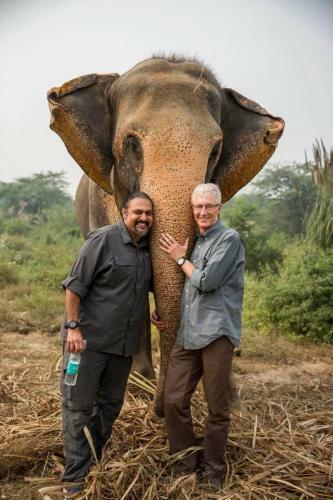 Paul O'Grady: For the Love of Animals - India next episode air date provides TVMaze for you. EpisoDate.com is your TV show guide to Countdown Paul O'Grady: For the Love of Animals - India Episode Air Dates and to stay in touch with Paul O'Grady: For the Love of Animals - India next episode Air Date and your others favorite TV Shows. Add the shows you like to a "Watchlist" and let the site take it from there.